From hoodies, t-shirts, bracelets, mugs & motivational poster, we’ve got you covered. The Process not Perfection tee with signature Kinion Flying Elephant is printed on Hanes Classic Tagless Tees and is available in a wide variety of colors. 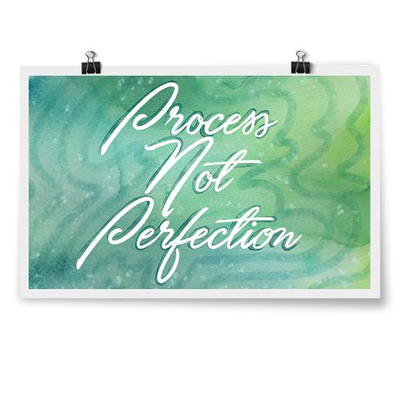 As we all know nothing in life seems to go as planned, that’s why I like to think of it as a process not perfection. 8" around and made of silicone, the letters are debossed and color-filled to last! Purchase include one (1) wristband. Available in a wide variety of colors, the Process not Perfection Mug with our signature Kinion Flying Elephant is waiting for coffee, tea and cocoa. The Process not Perfection tee with signature Kinion Flying Elephant is printed on Gildan 8oz Heavy Blend Hoodies and is available in six colors.